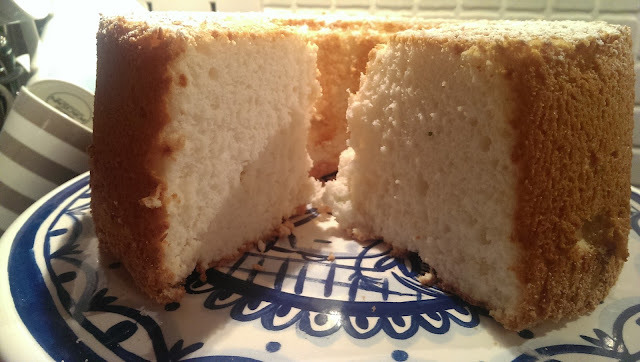 This is my first time making Angel Food cake inspired by last week's episode of the Great British Bake Off. I have made plenty of different sponges but this one has always eluded me, but boy was it worth the wait. This fatless sponge is absolutely sensational, its quite literally like eating a cloud or a big hunk of cotton wool. If you happened to watch the bake off last week you will notice so many people got it all wrong in the preparation. Firstly DO NOT grease or line the baking tin, the reason being is the batter needs to cling to the pan in order to rise, and secondly they needed to make sure the egg whites beaten to the correct point, just before stiff peaks. Also when you take out the cake you need to turn it upside down on a wire rack to allow the air circulate all over the cake. When the cake has cooled fully, all you need to do is cut the cake out of the tin with a thin sharp knife. 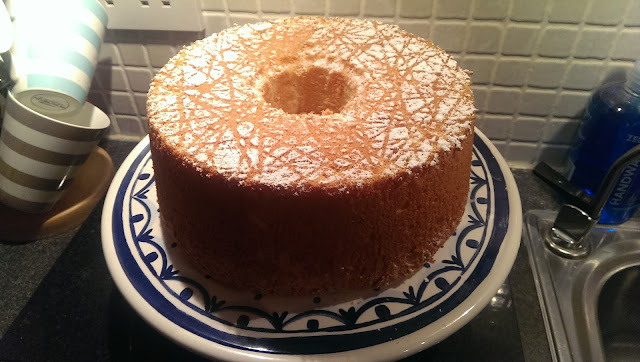 I know you will love this, I will definitely be making this again it's one of the best sponges I have ever eaten. Preheat the oven to 180C/350F/Gas 4 (fan 160C) and arrange an oven shelf in the bottom third of the oven. Sift the flour and 100g of the caster sugar together in a bowl and set aside. Whisk the egg whites in a large bowl with an electric hand whisk or mixer on a high speed for one minute until frothy. 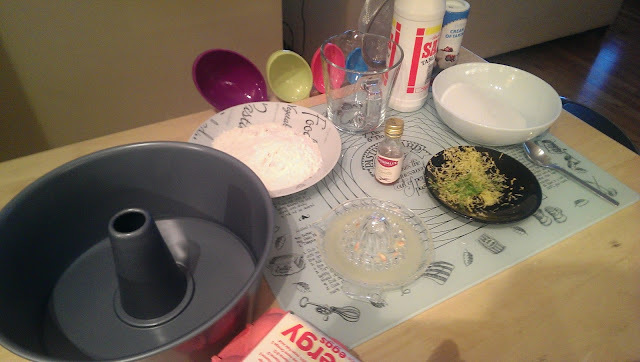 Add the lemon zest, lemon juice, cream of tartar and salt and continue whisking for 2-3 minutes, or until soft peaks form when the whisk is removed from the bowl. Increase the speed and add the remaining 200g of caster sugar, one tablespoon at a time to form firm, but not stiff peaks. Sprinkle over one-third of the flour mixture and fold gently to combine. Repeat with the remaining two-thirds of the flour mixture folding gently to keep as much air in the mixture as possible. 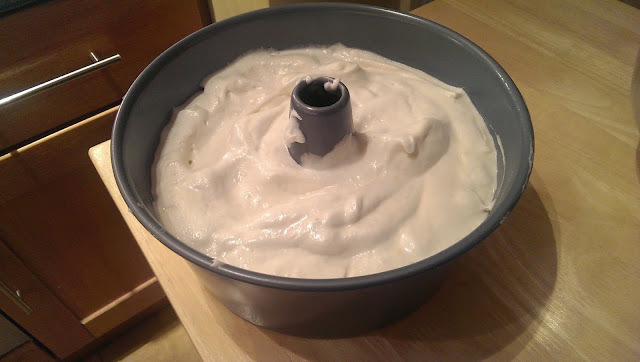 Transfer the batter to a 25cm/10in angel food cake pan. 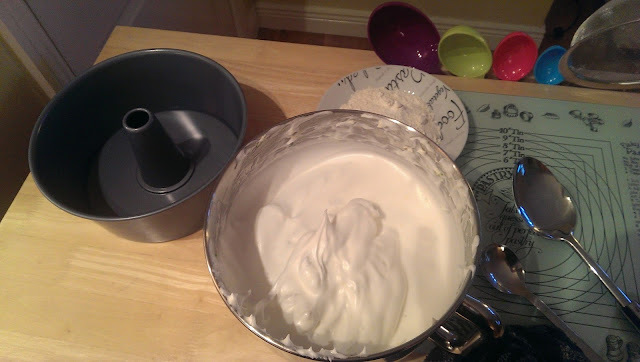 Gently run a knife through the centre of the batter to remove any pockets of air. 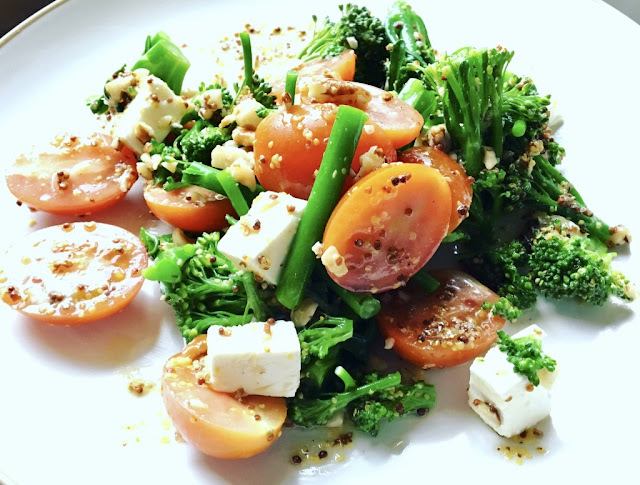 Cook for 45-50 minutes, or until a skewer inserted into the centre comes out clean. Remove from the oven and immediately turn upside down onto the tin’s cooling legs, or place over the neck of a wine bottle. Leave to cool for at least one hour. Run a knife around the inner and outer edges of cake to remove it from the pan. Invert onto a plate. Carefully use a palette knife to separate the cake from the base of the pan. Leave to cool on a wire rack. Just look how light and cloud like it is, please make this everyone will love it !